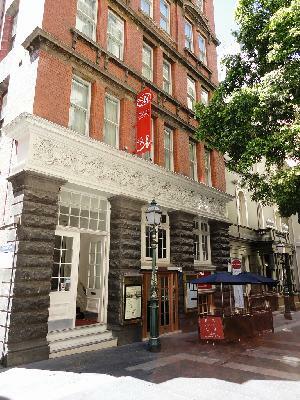 Housed in a heritage-listed building the Metro Apartments on Bank Place provides business or leisure travellers with a range of luxury studio and 1 bedroom furnished apartments that are fully self contained and perfectly situated right in the heart of the Melbourne city centre. The property is conveniently tucked away down a quiet cobblestone lane, which is why it offers a tranquil escape amongst the hustle and bustle of the city. The boutique serviced apartments and hotel rooms that are available at the Metro Apartments on Bank Place have all of the modern conveniences that you would expect from such a high quality property. The 1 bedroom apartments have a well equipped kitchen and laundry facilities, making then ideal for short or long term extended stays in Melbourne. The studio apartments feature kitchenette facilities and provides great value for money discount rates. Whilst you are staying at the Metro Apartments on Bank Place Melbourne you can experience the vibrant nature of the city with its different cultures, popular night clubs on Little Collins and Queen Streets, fabulous shopping, fine dining, exciting entertainment and multitude of major sporting events. The Metro Apartments on Bank Place is positioned right in the heart of the Melbourne CBD and is only a short walk from the Exhibition Centre, Crown Casino and Entertainment Complex and the famous Southbank Promenade. For shopping the famous Bourke Street Mall is just 5 minutes walk and you are only a short tram ride to major sttractions such as the MCG, Rod Laver Arena, Queen Victoria Market, Etihad Stadium, Hardware Lane Precinct, Eureka Tower Observation Deck, Melbourne Aquarium and much more. Guests can also walk to Melbourne's finest restaurants, theatres, shops and bars from the Metro Furnished Apartments on Bank Place.